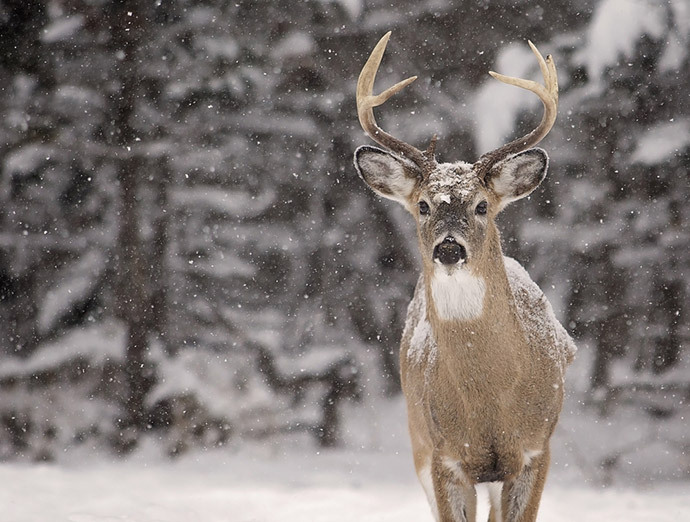 →How Do Deer Survive the Winter? Here are the Top 5 Reasons Why! 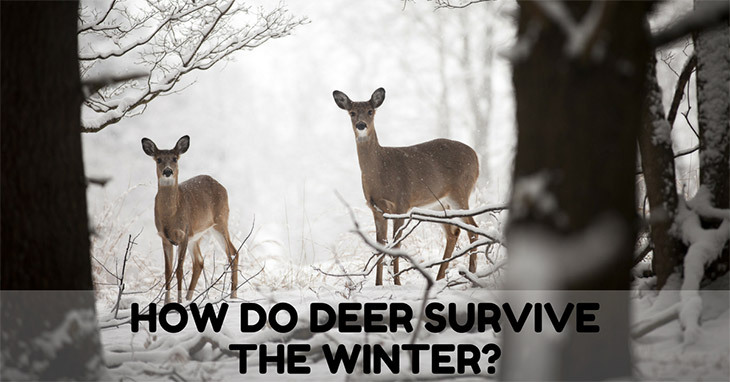 Have you ever found yourself asking, how do deer survive the winter? If you have, then you are not alone. 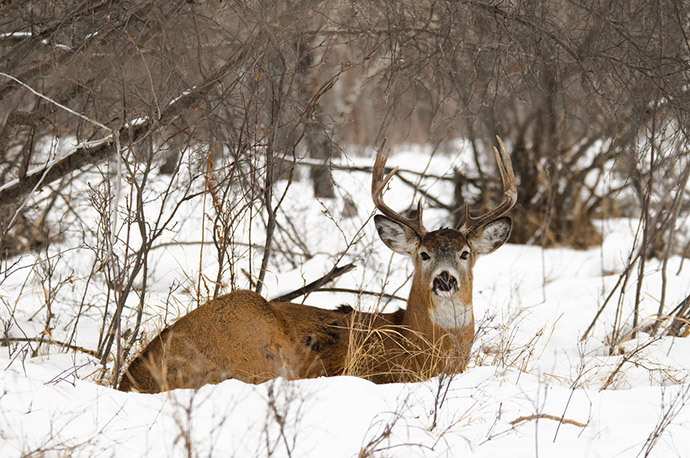 If you’re a new bowhunter thinking of harvesting some whitetails in the snow, then chances are that this question might have crossed your mind at some point. Or you could be a concerned citizen who is fond of deer and other animals. Either way, it is a valid question, and it is something I intend to answer in this article. Today, not only will I answer whether deer freeze come wintertime, I will also give some of the reasons why they usually don’t. Are Deer in Danger of Freezing in the Winter? “Do deer freeze in the snow?” I often get questions like this from concerned people, especially when the winter months begin to set in. Understandably, many who aren’t familiar with a deer’s biology and habits may get worried about these four-footed forest creatures. The quick answer is: No, deer don’t usually freeze in the winter. Unless there’s a drastic drop in temperature overnight, deer can normally tough it out and stay warm even in below zero degrees weather conditions. This doesn’t mean that deer are impervious to dangers caused by freezing temperatures. There is always a chance that a deer may not last a long winter, especially if it wasn’t able to prepare as much during autumn. Like other living things, deer just know how to adapt to different environments, cold winters being one of them. How Do Deer Survive the Winter? Many wildlife biologists, like those from the Maine Department of Inland Fisheries and Wildlife, have discovered a scientific explanation as to how deer can survive extreme weather conditions. As it turns out, deer shed their coat twice a year—once in the spring and another in autumn. While a deer’s hair coat from spring to summer has solid shafts to allow its skin to remain cool longer, its autumn to winter coat has hollow shafts, which can absorb and trap heat, thereby insulating the deer’s body against the cold. Deer prepare for the long winter months by storing excess body fat during autumn. Most of this body fat is stored under the deer’s skin or around its internal organs and will slowly burn out as the winter progresses and the deer requires more body heat. In order to store fat, a deer has to change its diet from one that is rich in protein to one that is rich in carbohydrates and essential fats. To do this, it usually focuses on carbohydrate-rich food such as nuts, fruits, and non-wood perennials. Of course, it’s not enough for deer to shed their hair coat and store body fat to survive the winter. They also need to conserve energy during the winter months so that they don’t burn up their fat reserves early on. One way that deer save up on energy is by decreasing their movements. Since deer don’t hibernate like polar bears, they simply try not to move as much as they do in the summer months. This means less foraging for food, which I think is one of the main reasons why post-winter deer are usually thinner than summer ones. Deer normally move to a different part of the forest during the winter. They usually prefer areas with thick and dense trees and conifers that not only block harsh, freezing winds but absorb more of the sun’s heat as well. Deer also try to head for south-facing slopes because these usually face the winter sun directly and as a result, they get less snow than other spots. There is also fewer chances for the deer to avoid a cold north-wind from this spot, and spring plants usually bloom in these slopes first because of its exposure to more sunlight. 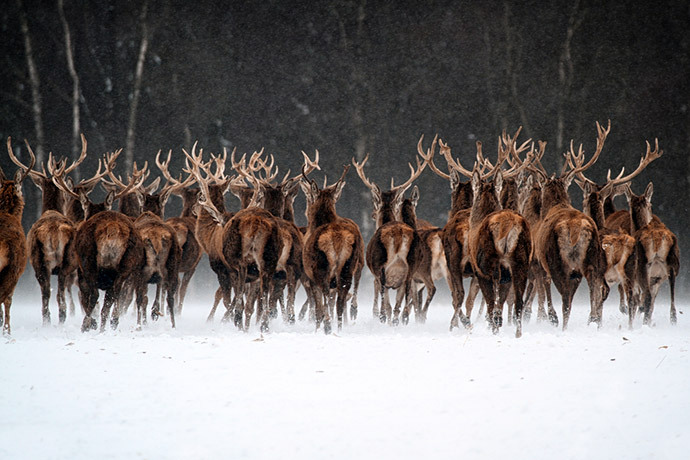 While deer usually stick with their direct families in the spring and summer months, they tend to congregate and form larger packs once the autumn season comes in. Not only does forming bigger groups helps fawns and older bucks be warmer because of communal body heat, it also helps keep the herd safer from predators that may try to prey on them come winter time. Yes, deer have a harder time during winter because of harsh weather conditions, but they have also learned to adapt well after all these decades. Unlike humans who would normally freeze outright on a cold winter night if he is not insulated well with warm clothes, a deer can last until morning because of its hair coat especially designed to trap heat and keep the deer’s body warm. If you’re concerned and are thinking of ways to help deer survive the winter, the best thing you can probably do is to avoid making them exert more energy than they have to, since this makes them burn more fat than they need to keep themselves warm. You may also want to steer clear of south-facing slopes and dense conifer shelters where deer may be hiding in, as this may disturb and cause them to scatter in a panic. Is this article helpful? Do you know of any other ways to help deer survive the winter? Leave them in the comments’ section below. Let’s discuss!